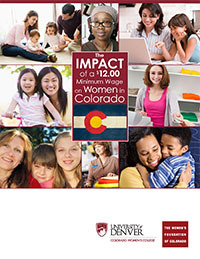 The Impact of a $12.00 Minimum Wage on Women in Colorado examines who would be impacted by an increase in the Colorado minimum wage, and the effect of a higher minimum wage on Colorado’s workers and its economy. The report examines how increases to the minimum wage impact earnings, poverty, and gender and racial equality. This research also investigates the potential impact on child care affordability and families’ eligibility for public support programs and highlights policy considerations for Colorado lawmakers on how to best support Colorado women and families in achieving economic self-sufficiency. The proposed $12 per hour minimum wage will boost income for approximately 290,000 women. Incomes will increase for 20% of all households in Colorado, including 200,000 households with children. Most of the increased earnings will impact workers over 20 years of age and households earning less than $60,000 annually. The impact on overall prices is small, as consumer prices may rise .1-.2% per year over the transition period, which is well below the average cost of living increase of 2% over the past generation. Child care costs are not expected to increase substantially, especially in parts of the state with higher cost of living, such as Denver and Boulder. Childcare costs are driven by cost of living, not minimum wages. Since increases in minimum wages will have little effect on overall wages throughout the state, they should have no statistically significant or meaningful impact on childcare prices. A minimum wage increase would be a net positive for minimum wage earners and the state of Colorado. It would increase earnings, strengthen the economy, and reduce economic inequity in our state. Only a very small number of Coloradans may lose benefits if the minimum wage is increased and in most of those cases, women and their families still come out ahead because the increase in income will be greater than the value of benefits they may lose. This study is the first collaborative, cross-university research initiative developed and funded by the new Colorado Women’s College Collaboratory (CWCC) of the University of Denver. This CWCC research initiative is a partnership with The Women’s Foundation of Colorado, and engaged research faculty from Daniels College of Business and the Graduate School of Social Work at the University of Denver. This research was funded by Colorado Women’s College, with additional support from the University of Denver Faculty Senate’s Faculty Research Fund.